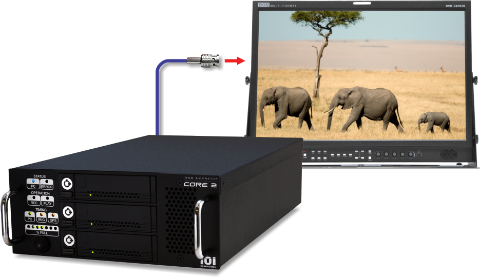 The new DVR Express® Core 2 MAX builds on the success of the Core series, offering more camera inputs and faster direct-to-disk recording speed, enabling more of the latest industrial and scientific cameras to be reliably recorded over long durations. As well, the faster host PC speed means better live video display and shorter file export times. All DVR Express® Core models support uncompressed video recording at the maximum data rate of their respective video standards – with no frame drops. 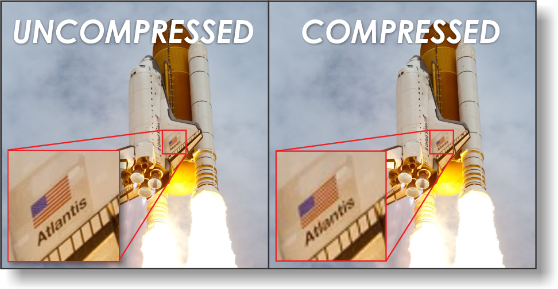 Every captured frame of video is time-stamped in hardware with sub-microsecond accuracy. Core’s internal timer can be synchronized to the time clock of a remote computer facilitating synchronization to IRIG-B and GPS receivers. 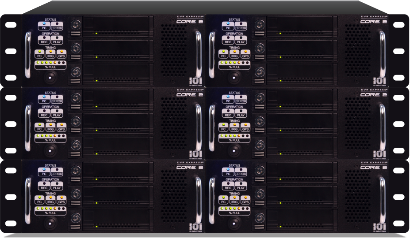 Core’s RAID storage engine provides an added level of protection against data loss. With image sensor resolutions and frame rates always advancing, digital video data rates continue to climb. The DVR Express® Core 2 can record video at data rates up to 1620 MB/s, but for the ultimate in high-speed recording, the DVR Express Core 2 MAX can record at data rates up to 2240 MB/s! This meets or exceeds the rates of any combination of video cameras that can be connected at once. This extreme recording speed is only possible when the Core 2 MAX has six high-speed VidIO Drive Modules installed. With this capability you can record four separate high-speed cameras or one very fast camera, such as one with four CoaXPress CXP-6 outputs. Timing can be everything when it comes to video analytics. Understanding the precise time when a frame is captured allows a better correlation of imagery to other data sources, such as telemetry systems, environmental sensors, or other DVR systems in other locations. 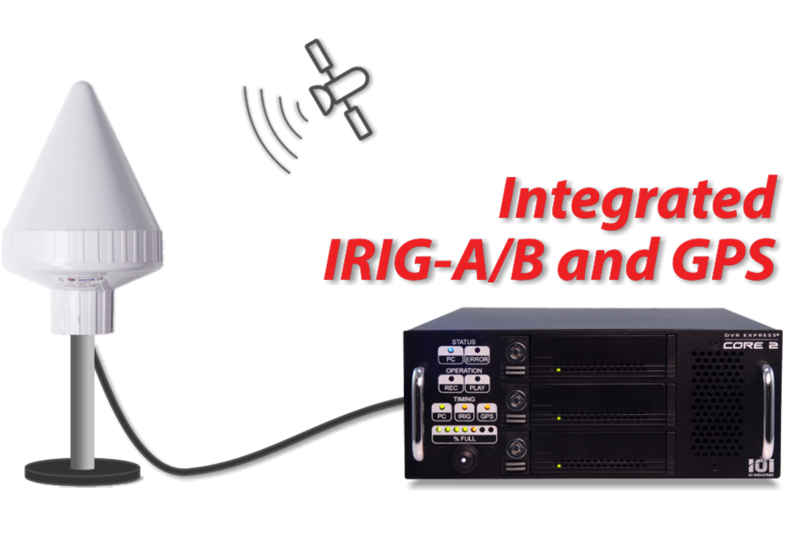 DVR Express Core 2 MAX includes IRIG-A/B inputs as a standard feature, to synchronize with many formats of IRIG timing signals found in major test facilities and airborne platforms. As well, an optional high-accuracy GNSS receiver can be installed, allowing independent synchronization with not only GPS, but also GLONASS, Galileo or BeiDou satellite navigation systems. The DVR Express Core 2 MAX features four 3G/HD-SDI video outputs providing low-latency video signals for real-time monitoring of the incoming camera data. 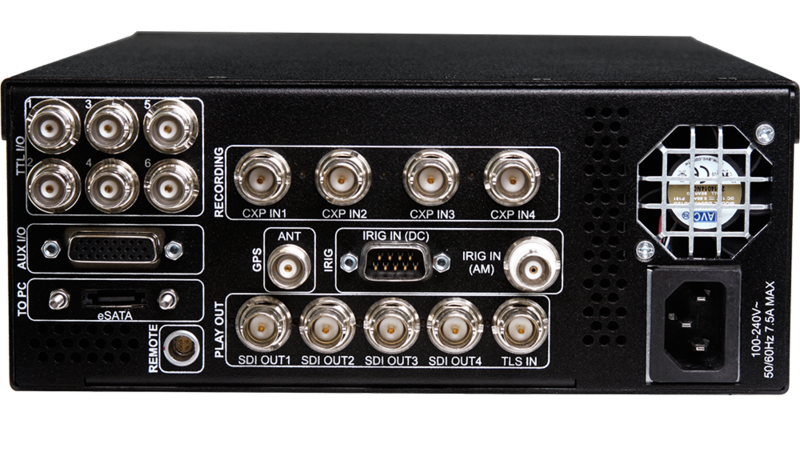 SDI video signals can be directly connected to supported monitors or HDMI displays using off-the-shelf adapters. SDI video can even be wirelessly sent over long distances using RF transmitters. Four 3G/HD-SDI outputs are provided, allowing up to four cameras to be monitored. After recordings are completed, recorded video will be played out from these outputs as well. The output formats include 1080i, 1080p and UHD at up to 60 frames per second. Traditional high speed video cameras rely on internal memory for storage, usually with enough capacity for a few seconds or minutes of video at most. 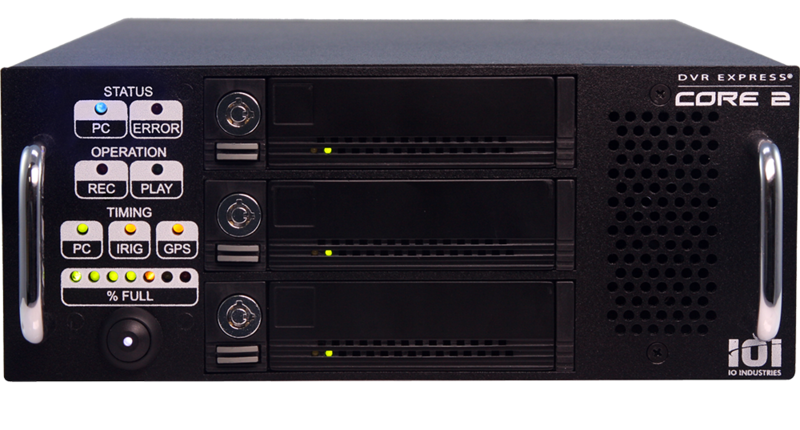 The DVR Express Core 2 MAX can be configured with up to 22.5 TB of removable solid state storage, meaning tens of minutes if not hours of video can be recorded, without the need to download to disk after recording! Long-duration video recording allows for greater analysis of processes over time, a feature not possible with other camera systems. Also, if only short clips are needed, the high storage capacity allows many more experiments to be captured with no transfer downtime in between. Mounting a DVR Express Core 2 MAX couldn’t be simpler. With the chassis designed specifically for integration into standard 19″ hardware racks, this DVR is ready to be installed almost anywhere. 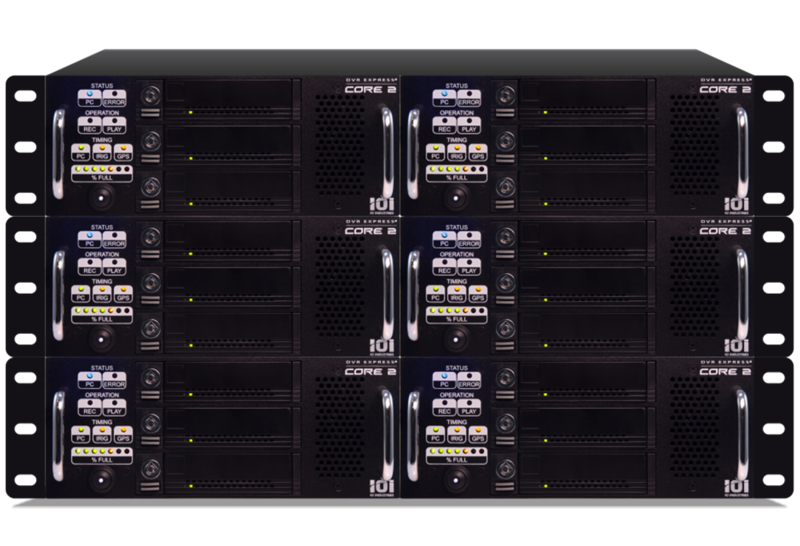 Each Core 2 MAX occupies a 2U rack height but only half the 19″ shelf width, allowing two DVRs to be mounted side-by-side. Whether the rack will be a rugged portable container or a fixed-location tower, the Core 2 MAX will mount effortlessly onto standard 2U rack shelf. Simply remove the four rubber feet installed on the base and attach the Core 2 MAX to the empty rack shelf, then install the shelf using the appropriate hardware. 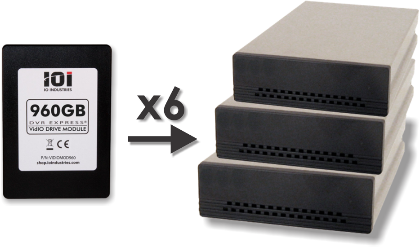 The DVR Express Core 2 MAX has three rugged removable drive cartridges, each holding up to two solid-state drives. The cartridges have an intermediate backplane rated for 25,000 insert/remove cycles, compared to the typical 500-1000 rated cycles of a drive’s native interface connector. This prevents damage to the drives from repeated ejections, which can be numerous when the data must be transferred multiple times per day. Using solid-state media ensures reliable continuous recording at high data rates, with no dropped frames, plus tolerance to shock and vibration. Video compression has its place with some applications, but when a critical experiment is underway and the best possible video quality is required, experts turn to the DVR Express Core series. These powerful recorders store high-bandwidth uncompressed video data from one or more cameras, preserving all the detail and dynamic range of the original digital video data. This allows frame-by-frame review of recordings as though each frame is its own still picture. After the recording is complete, clips can be exported into formats that do support compression, such as AVI or JPG, but the original data is always preserved. 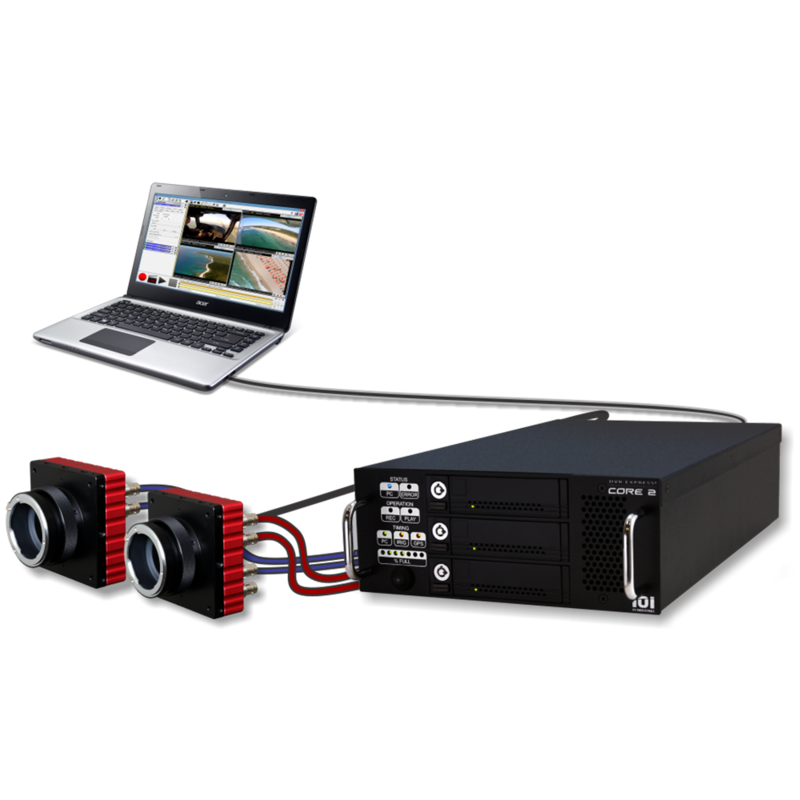 The DVR Express Core 2 MAX can record from up to four cameras simultaneously, simplifying multi-camera recording applications such as motion capture, stereoscopic imaging, volumetric particle tracking and more. As well, built-in synchronization tools allow accurate alignment of each camera’s exposure, provided the cameras support such features. External frame synchronization signals can be connected to the Auxiliary I/O port of the Core 2 MAX, or signals can be generated internally using the Signal Generator tools. 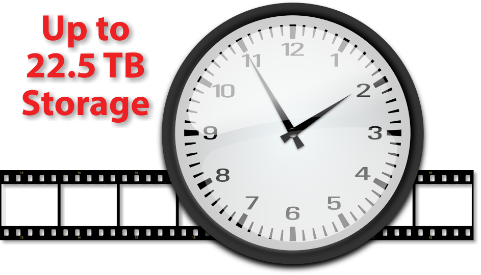 Timestamps can be applied to the images based on the exposure trigger point or any time thereafter. Easy-to-use CoreView™ software is included with each DVR Express Core 2, allowing configuration and operation of one or more DVRs. Each camera is shown with an independent display window, and multiple monitors can be used to show each camera full-screen on separate displays. After recording, files can be played back or reviewed frame-by-frame, then exported into commonly-supported image or video file formats including BMP, JPG, TIF, AVI, MOV, RAW and more. A backup feature also allows recordings of one or more camera from one or more DVRs to be saved together in a local file for later review. Like the first generation Core DVRs, the DVR Express Core 2 MAX is also a PC peripheral, intended to be connected at all times to a PC system. The PC interface allows for DVR configuration, operation, live video display and file transfers after recordings are completed. The Core 2 MAX features a 6Gbps eSATA port, twice as fast as its predecessor, plus a USB3.0-to-eSATA adapter cable is included in case no eSATA ports are available. Multi-port USB 3.0 add-on cards are available for PCs, but for situations with many (5 or more) DVRs involved, multi-port 6Gbps eSATA cards are recommended (cards are available with 8 or 16 ports per card).